The things that you lose in the course of a long life, and the things you might somehow hold on to, are the stuff of Agnès Varda’s latest essay film–“stuff” being a clunky word to apply where this innately elegant artist is concerned but also inescapable, since she likens her method in this film to dumping the contents of a purse. Out tumble lint, valuables, makeup, mementos, business receipts, scraps of notepaper and pieces of identification, official and otherwise. Some of this accumulation, such as the family snapshots, might belong to any grandmother, as I think Varda would admit. Having dedicated a significant part of her work to making common cause with other women, she readily counts herself among their company. That said, though, she knows her career within this collectivity has been singular, and so are most of the odds and ends she pours out before the viewer. Founding member and sole woman of the French New Wave, witness to radical social movements and sometimes their abettor, entrepreneur, traveler, friend to a long list of artistic geniuses, she in effect brings out of her purse more than fifty years’ worth of assorted and idiosyncratic film clips, portrait photographs and snatches of music, not to mention some recently gathered views of places she’s known. “A puzzle,” she calls her life’s materials as she sorts and arranges them, “with a hole in the center.” Or, to switch to the metaphor of her new film’s title, the assemblage she makes looks like a meeting place of the elements, continually forming and slipping away: The Beaches of Agnès. You see her, in a prologue set in Belgium, tromping barefoot on one of the North Sea beaches she enjoyed as a child. 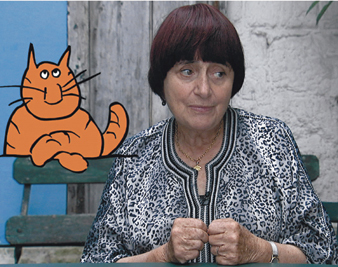 “If you opened people up, you’d find landscapes,” Varda explains. “If you opened me up, you’d find beaches.” Meanwhile, her assistants are setting up a multitude of mirrors on the sand, as if to prepare the filmmaker for her self-portrait. “Show me in an old spotted mirror,” she advises, looking into one that almost completely obscures her face, “or with my scarf blowing like this,” as she studies the effect of having her head completely covered. For the most part, Varda makes the reflections show only her young helpers and the waves, sky and dune grass. Things drift away and things abide, but the self who mourns and retains is elusive–perhaps willfully so. Varda scratches into the sand her original given name–Arlette–and watches the letters wash away. She speaks of the lone recording of classical music she heard as a child, and fragments of the piece rise on the soundtrack over the view of the North Sea: Schubert’s Unfinished Symphony. Playful, quizzical, at times deliberately clownish, Varda claims the status of enigma in The Beaches of Agnès, saying in this prologue that she is only pretending to be eager to tell about herself, much as she’s “playing at being an old lady” (this, at 79). “It’s other people who move me,” she declares. Considering the many characters who then figure in the film, and the love she lavishes on them all–from the baker down the street from her house to her late husband, Jacques Demy–I can believe her. But permit me a little skepticism too. This short-statured, long-nosed woman with the mushroom-cut hair that keeps changing color throughout the film and the clothes that might have come from the trunk of a regional theater company is too compellingly intelligent a commentator, and too engaging a companion, not to be the star of her own life story. By the end of The Beaches of Agnès, you will know a lot about what she’s achieved and how she’s done it. You just won’t learn this material in any order except the one in which she’s been pleased to dump it out. A surrealist of the tender and discursive sort (except when enraged), she enjoys curious juxtapositions and chance events and is willing to organize them if they don’t produce themselves. In the seaside town of Sète, for example, where she spent her adolescence, she hauls out an old-fashioned handcart like the one seen in her first film, La Pointe Courte, and converts it into the platform for a little movie screen, so that two of her old friends can push it through the twilit lanes while watching a projected image of their long-dead father. It is an image, perhaps, of film as a humble funerary rite; by contrast, Varda also gives you an impression of film as a busy if accident-prone game. To represent the office of her production company, Ciné-Tamaris, she has a few tons of sand dumped into the middle of a Paris street and then installs her staff at desks on this “beach.” A rainstorm blows in on the second day of shooting and destroys the set, but Varda greets the reversal with perfect equanimity. Her aesthetic, poised between mourning and play, has room for incompletion and happenstance. Besides, she’s endured worse than the loss of a location. As evidence, here are some of the photographs she took at the beginning of her career, in the late 1940s, when the actor and impresario Jean Vilar commissioned her to document his Avignon Festival. She was mortified, Varda recalls, when Vilar’s gesturing right hand came out blurred in one picture of Richard II. Now, she says, she likes to see blurs in photographs, especially in the foreground. She lets the screen fill with a few examples of such incidentally messy images, with their evidence of a life too ongoing to be fully captured. Then she shows herself walking through an exhibition of her Avignon photographs–immaculately printed, blown up to more than life size, installed within the serene symmetry of a chapel–as she breaks down and weeps for all these beautiful people who are gone. Her long relationship with Demy dominates her account of her filmmaking career. She credits him with getting her the opportunity to make Cléo From 5 to 7, discusses her visits to film festivals in the context of his triumphal progress, explains the course of her work in the 1960s in terms of her life with him on Noirmoutier Island and later in Los Angeles. But Demy is strangely absent from much of this narrative. Other family members, friends and colleagues appear prominently on the screen, in new or archival images–her children, Jane Birkin, Chris Marker (disguised as a cat)–but rarely Demy, except as a figure glimpsed through a courtyard window or a blurred white spot at the back of a production still from The Umbrellas of Cherbourg. He doesn’t really become a presence in The Beaches of Agnès until Varda recounts the end of his life: his illness with AIDS, his composition of a memoir about his youth and her efforts to make this piece of his writing into the film that has stood for nearly the past twenty years as her final narrative feature, Jacquot de Nantes. There’s a production still that shows Varda at work in her director’s chair, meanwhile reaching back to clasp hands with the husband she knew was dying. What slips away, and what you hold on to: to which did she dedicate Jacquot de Nantes? She would show Demy the scenes she was setting up, she recalls, and ask if they were accurate, and he’d tell her, “Yes. I can see myself in that.” So it was important to her to have these re-creations of his life–unlike the re-creations of her own life that she inserts into The Beaches of Agnès, calling them “just a game.” Varda says she doesn’t quite get the point of dressing up a little girl in a swimsuit like the one she used to wear. For that matter, she confesses that she feels no connection to her childhood experiences and no emotion when revisiting the house where she grew up. (The retired physician who now owns the place, and who wants to show off his collection of model trains–he’s something. “But the childhood home part is a flop.”) I might guess, then, that the surrealist play of turning life into images becomes urgent for Varda mostly in retrospect, when the subject has gone or is going. If she doesn’t take very seriously the images she creates of her past, it’s perhaps because she’s never lost herself. And yet she turned 80 while making The Beaches of Agnès. Surely she felt her own mortality. I’d say she did; and the wonder of this late masterpiece is that she acknowledges her mortality in it in three different ways, as everywoman, as a singular woman and as the hole in the puzzle–no woman at all. As everywoman, she shows herself at the end posing happily under a tree with her children and grandchildren, dressed in white and standing a little apart from the others, as if already moving toward the next world. As a singular woman, she tacks a coda onto the film: a record of her raucous eightieth birthday celebration, with well-wishers trooping into her Paris headquarters to salute the aged great lady. But it’s as no woman at all that she composes the third and most moving finale of The Beaches of Agnès, which consists of a view of a shack she constructed near the beach on Noirmoutier Island: little more than a frame enclosing an empty space. You might say that Varda is the void in that shack, whose rippling, fragile walls, suspended from the frame, are strips of celluloid unspooled from a print of her mid-1960s film Les Créatures. There’s nothing in the shack–and nothing to it, either–except for light, color and ghostly images of Catherine Deneuve and Michel Piccoli: something that’s lost and preserved at the same time. Originally presented at the 2008 Venice Film Festival, The Beaches of Agnès begins a US theatrical release on July 1, at Film Forum in New York City. A blatant knockoff of American Idol, except that the female contestants get death threats, the Kabul-based television show Afghan Star has been passionately followed by as much as one-third of the country’s population, according to a new documentary by director Havana Marking. Country boys hurried home through the fields to watch it. Girls in small towns, eager for good reception, climbed to their roofs to prop up antennas with rocks. Auditions for the program, held in cities throughout Afghanistan, attracted some 2,000 would-be contestants, three of whom were brave enough to be women. The weekly cellphone voting for audience favorites took on the character of a grassroots political campaign, with supporters of different singers making their headquarters in pool halls and used-car lots and even holding photo-ops in the courtyards of mosques. On the wisdom of this latter initiative, though, opinion was divided. The government-backed Islamic Council warned that the godless doings on Afghan Star would cause the faithful to rise up in war. And when the Taliban, for military purposes, began attacking the country’s cellphone networks, one of the side benefits from their viewpoint was the disruption of voting for Afghan Star. Marking’s documentary, which shares a title with the TV show, follows the fortunes of four of the contestants–two women and two men–from different regions and ethnic groups, while also profiling the show’s host (a defiant pop culturalist who ran a clandestine TV repair shop during the Taliban era) and a family of devoted fans (who remember the Soviet years as a golden age of rock music and mixed dancing). I tell you, Afghan Star has everything: suspense, pathos, humor, songs, landscapes and large-as-life characters. There is even a message: that the showbiz cheesiness we Americans might deride can be a source of hope for people literally dying to sing. An audience favorite at the recent Human Rights Watch International Film Festival, Afghan Star opens in theaters June 26.